Light up your features with Sculpt Three, a silky fan brush with short bristles that releases a soft wash of highlighter over the skin. 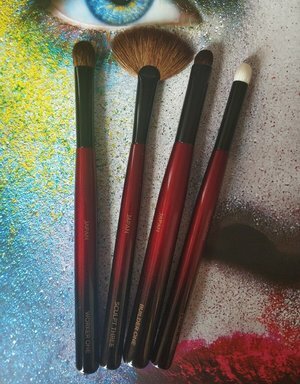 Unlike other fan brushes on the market, Sculpt Three picks up a generous amount of product and lays it down with control. The thin shape is also perfect for precise contouring and bronzing. 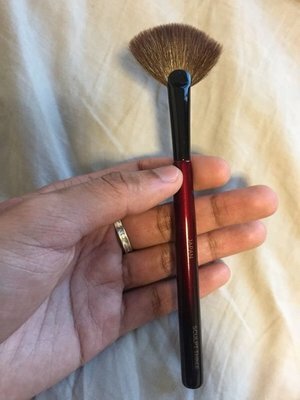 “This brush was designed for highlighters, but it’s also a secret weapon against patchy, harsh bronzer and blush. It picks up a generous amount of product and works with control.” — Sonia G.
Pick up product with the sides of the bristles and gently tap off any excess. Apply starting where you want stronger placement, and then swipe to diffuse as desired. This is an awesomely versatile brush on so many levels. I bought it as a whimsical add-on, not as something I thought I needed. Hah! An eye-opener. Highlighter: Perfect size and shape for modern highlighter trends (whether tapping, swiping, or fluttering). Great size+curvature for taking highlighter around the temple. Perfect for selected forehead highlighting, vertically down the nose, horizontally across nose tip and the Cupid’s bow. So easy, so fast. The goat hair bristles pick up product really efficiently, so be light-handed when first trying it out. If you love beaming highlighter applications, this brush can do it in a heartbeat. It can just as easily be merely tapped into product to satisfy minimalists seeking a hint of a glow. Sculpting: Shape and size allows for true targeted sculpting in cheek hollows. I prefer to use an outer third of a flatter side of the arch tapped in Kevyn Aucoin Sculpting Powder. I tap/apply it carefully near my ear with the point of the arch aimed towards my nose, and diffuse it ever so slightly to create a detectable-but-undetectable shadow. It also sculpts the nose efficiently - just lightly tap the very top edge of the arch in sculpting product, and in a sweep or two it’s applied and diffused down either side of the nose. Eyeshadow-in-a-hurry: On a busy morning I reached for Sculpt Three to apply a veil of neutral eyeshadow from brows downwards because it happened look like the right size/density/width for maximum efficiency. It worked. The time saved was wasted in stunned awe. Love the handle thickness, length, and weight in conjunction with this brush head. It feels perfectly natural for everything I’ve used it for, at all sorts of angles. Versatile density: density thicker in the centre, thinner at the ends. Softness: Soft, soft bristle tips but with enough resilience down the bristle length to keep its structure. I trust in thee Sonia G.
I usually will scour the internet for reviews and insight on anything before a purchase. This is something, that I took a different route. 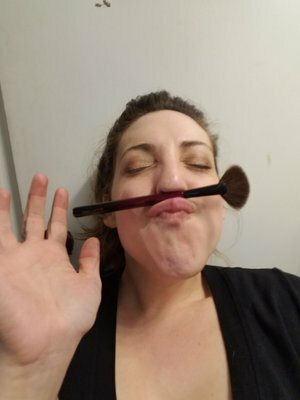 I was driven by curiosity of a new product launch at beautylish, and what confirmed my buy, was reading about Sonia's journey and love of brushes. They're designed by someone who truly wants the best use and construction, aka, a lady who knows what she wants! I love fan brushes, but flimsy can be frustrating. Her writeup on using this as a sculptor was music to my ears. The construction of the brush is top notch, the density of the fan has me using it as an impeccable blush and contour brush. 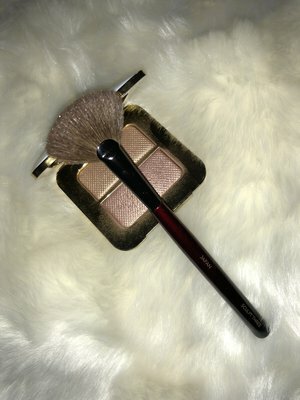 I actually love this brush with the new ND diamond and blush, for blush and blushtopper application. It's my first brush from the Sonia G line, and absolutely won't be my last. I'm thankful beautylish made these available individually otherwise I may have continued to overlook them sadly! I love this fan brush. I had the original Wayne Goss fan brush but it was too big and I gave it away. I really liked his newer fan brush and found it worked better for me than the original one. This Sculpt Three makes me realize how wrong I was about that. This brush is such a great size and density for applying highlighter. Holy smokes! It applies it to perfection with little to no effort and because it is a smaller size, you can be more precise. I love this brush. I just bought and received these three little brushes. I usually just use a blush or contour brush to apply a little highlighter on my nose and cheekbone.....This is so much better. It dusts a perfect amount of highlighter perfect shape...perfect size....who knew I even needed this brush....These brushes are so well made and so beautiful. A bit pricey, but start with one...I bet you will want to collect them all. I am so grateful that she is selling them individually. The handle is beautiful and bristles so soft. I'm probably the rare person who uses this as my cheek co your brush, but it's Mansi go for that. 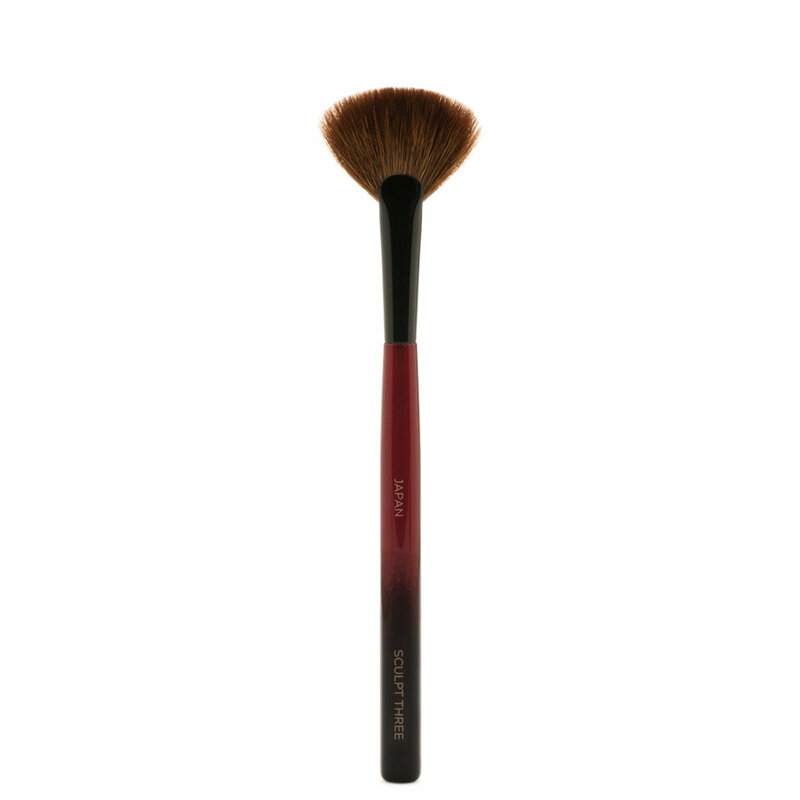 I've used so many different brushes and none can match the effortless application for cheek contour than this one. Of course it's also perfect for highlighting the cheeks, so you can bring one less brush when you travel. I own some fan brushes of wayne goss, zoeva and hakuhoudo, and they don't come close to this one! This one is denser and has more flexibility, and applies highlighter beautifully. Also the handle is perfection, the best lacquer on the market, feels luxurious and pleasant to use. Best fan brush on the market absolutely Phenomenal brush! It’s small enough for precise highlighter application and is not too wide so it brings the highlighter on the apple of the cheek..my biggest peeve with the Wayne Goss fan brush was that it was too wide for my face and it splays however the Sonia fan brush does not splay. Its very effortless and blends the highlighter on the face seamlessly.It’s extremely soft and I LOVE the design! Also the small details are to die for like the Japan logo on the side , the trident logo at the bottom and the faded lacquering from red to black. This brush is small but can carry a lot of pigment so you have to be aware of that before you accidentally highlight yourself into a tin man. 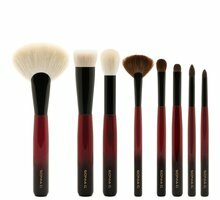 The bristles are very soft, they feel like the older Wayne Goss brush set with dyed bristles. I think it will be perfect for subtle contouring or even a thin veil of blush on the cheeks. Such a versatile little brush! I really had to struggle with this gelee type of highlighters or with the hard pressed ones but not anymore!! Because now I have the Sonia G Sculpt three!!! ❤️❤️❤️ I am so glad that I have this one!! The three Sonia G brushes are the best invested money in makeup tools so far ⭐️⭐️⭐️⭐️⭐️ This small fan brush is everything one needs for all types of highlighters.